In the winter the rockpiles are more visable than in the summer. I enjoy the shadows and shapes the snow makes, they are ever changing. The window in the middle is where the computer is and so I am looking at the rocks every morning checking my e-mail. Not quite visable, on the right is a tall collection of rocks. 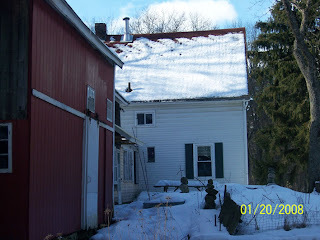 My son Coert brought those from the Swift River and stacked them on one of his trips here. River rocks are much smoother than our "country rocks". I love stacking rocks and there are many of these "cairns"all around the neighborhood. I'll try and find the egg tempera paintings I made of them. 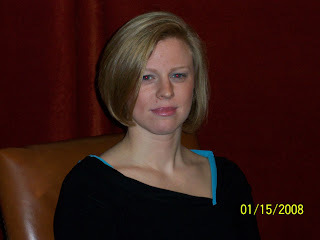 Last tuesday we had a wonderful model in Princeton, her name is Lauren. She works in the same WPI medical office as Regina and Donna, (see november). Next time we have a model I will make pictures of the other paintings as well and not only my own. She liked Jean Murphy's painting best and bought it. Now that the holidays are over winter has started to get serious. This is the time of year that I start longing for flowers..... however much I enjoy the light, color and shades of winter. I started my Amaryllis late so that is not yet blooming. The Paperwhites are budding; but the most important, the Hyacinth is blooming. I miss the smells from outside in the winter. The earth, the sheep, fresh mown grass and the flowers blooming. 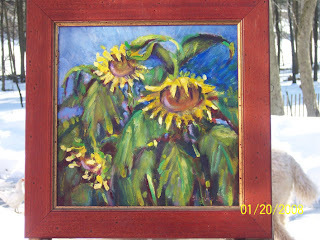 It is around this time of the year, that I dig up my paintings of flowers and hang them up all around me. 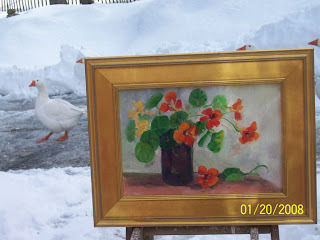 The first one, of the Nasturtiums, was painted last autumn. The Sunflowers are from last summer. 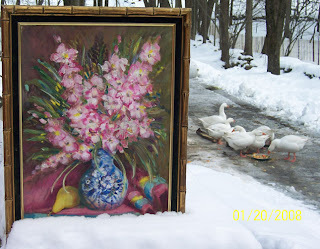 The Gladioli are from my garden some years ago. The vase they are in is my own Worcesterware. Still haven't got the date on my camera under control.... But anyway. 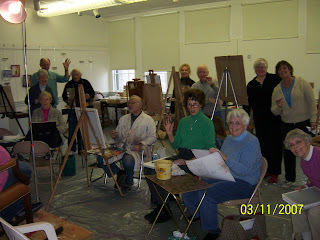 This week was the first time that the painting group came together since the holidays, we had a lot to tell eachother. Sid Solomon (seated above center with "white"coat) is having an exhibit of is locally painted landscapes, portraits and still-lifes at the Worcester Jewish Community Center. The opening will be Sunday, January 13, from 2-4pm. We painted Lynn Wrona's granddaughter, Sarah, today. She was a great model. I also signed Coert up to pose for us on February 26th. I'm counting on him to plan his trip home around posing and cutting firewood.. The loggers are all done now, the big machines are gone. 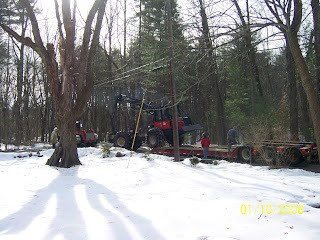 Below is a photo of them loading the forwarder... Peter is supervising; he is standing well out of the way just to the left of the big maple tree. The logger left us some firewood. It needs to be cut, split and stacked. This will be a project for Coert when he comes next month. 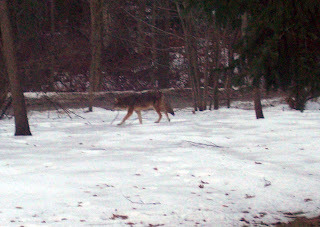 During their time here, the loggers have seen six coyotes at once and seven deer, does with yearlings This morning there were two coyotes in the front yard. 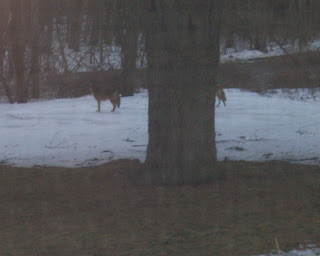 I took the pictures out of the window as not to scare them before I had proof of them. They are about as large as my standard poodle, with faces like a cat. When you see them you know for sure that they are NOT dogs.... See for yourself in the photos. I'd like to open this post by wishing everyone a happy 2008. Continuing on..... I'd like to introduce you to Henry E. Kinney (1866- 1954) respected horticulturist, ornithologist and (the part that inspired me) a painter. 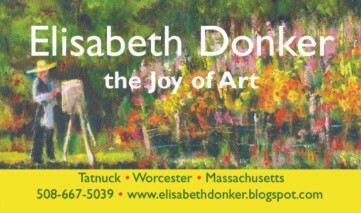 I came into contact with his work during my early years in Worcester and he inspired me to paint trees, tall trees with color. 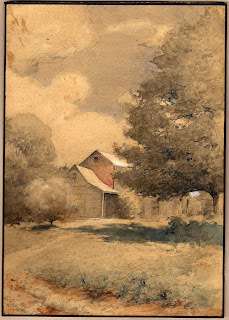 I have been told that he left a barn-full of paintings and I'm trying to track some down. I have a start as the son (T.S.) of a dear friend (R.P.S.) 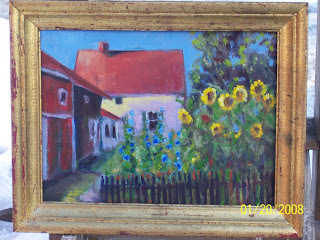 was kind enough to e-mail a photo of a painting in his possesion. 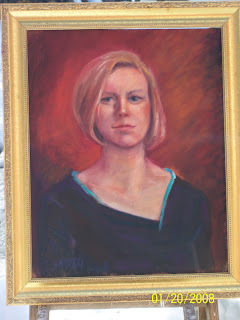 I also know of a number of paintings lost in a housefire down the street a few years ago. 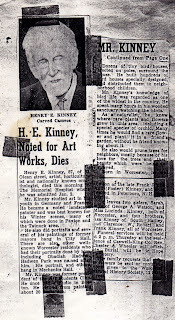 Searching on the web I have found little reference to Henry E. Kinney. He entered a portrait in a summer exhibit in 1902 and designed a nestbox specifically for Tree Swallows. 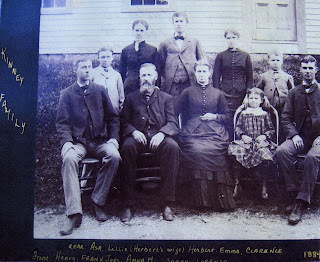 Below, again thanks to T.S., a family picture with Henry E. seated front row on the left and his obituary. Hopefully I'll find more of his work to appreciate and share. Top priority right now though is getting my studio warm enough to paint.